Today is Annual Road Trip Day! I am half excited half apprehensive. Last week I decided that I wanted to go to Traverse City since I haven't been there as an adult. And because neither of us have to work tomorrow we decided we were going to spend the night in Traverse City. 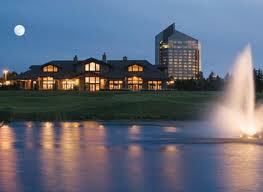 I booked a Tower room at the Grand Traverse Resort for tonight. A BLIZZARD WARNING REMAINS IN EFFECT FROM NOON TODAY TO 7 PM EST MONDAY. * SNOW WILL DEVELOP ACROSS NORTHWEST LOWER MICHIGAN TODAY... AND WILL BECOME HEAVY AT TIMES FROM THIS AFTERNOON THROUGH MONDAY. SNOWFALL TOTALS OF 10 TO 20 INCHES WILL BE POSSIBLE THROUGH MONDAY AFTERNOON. * SUSTAINED WEST TO NORTHWEST WINDS OF 20 TO 30 MPH... WITH GUSTS OF 40 TO 50 MPH... WILL DEVELOP THIS AFTERNOON AND CONTINUE THROUGH MONDAY. THIS WILL RESULT IN WIDESPREAD BLOWING AND DRIFTING SNOW... AND BLIZZARD CONDITIONS. * ROAD CONDITIONS WILL RAPIDLY DETERIORATE TODAY... AS ROADS BECOME CLOGGED WITH FALLING AND DRIFTING SNOW. POOR DRIVING CONDITIONS WILL PERSIST THROUGH MONDAY NIGHT. VISIBILITIES WILL DROP TO NEAR ZERO AT TIMES IN FALLING AND BLOWING SNOW. A BLIZZARD WARNING MEANS SEVERE WINTER WEATHER CONDITIONS ARE EXPECTED. FALLING AND BLOWING SNOW WITH STRONG WINDS AND POOR VISIBILITIES ARE LIKELY. THIS WILL LEAD TO WHITEOUT CONDITIONS... MAKING TRAVEL EXTREMELY DANGEROUS. IF YOU MUST TRAVEL... HAVE A WINTER SURVIVAL KIT WITH YOU. IF YOU GET STRANDED... STAY WITH YOUR VEHICLE. Right. No refund on the room and never ones to weenie out - so we're going. We borrowed MommaBeans 4x4 truck for the expedition. I've packed extra hats, gloves, scarves, coats, blankets and one of those fancy emergency road packs in the truck. And that is that! So now, I am going to fry up some bacon, the once a year treat for Mr. Wonderful & make french toast for our breakfast and then we're off! Catch you on the flip side with pictures! P.S. you NEVER did post any pictures of the trip...and...you did post you found your camera!! What's up with that??? My Dearest MommaBean - what is up with that is: A job. You know... 6a-4:30p? Hmmmph.